Do you remember what Steve Jobs said about the iPad? It was intended to be a platform for consuming media - listening to music, watching video or reading books and magazines. I suppose that’s why there’s nothing like the Mac's Finder built into Apple's iOS operating system for portable devices. My Files is an iOS app designed to fill that vacancy. It lets you do things you expect to do with a computer, like create folders and text files and do things like cut, paste, delete or rename - all the things we learned to do with a computer. The app also includes a document viewer plus an audio and video player. You can view PDF, Word and Excel files, extract files compressed with ZIP or RAR utilities and send a file as an email attachment. 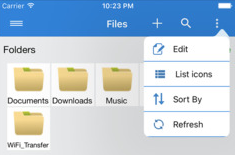 In the app, files appear with a + button that reveals a menu of action when it’s tapped. You can also use a long press to select or deselect text and other data. File security is protected with a passcode and encryption. My Files is available as a free download in the iTunes App Store.